Circus Couture “Encompass” raised an impressive $279,000 on Friday, October 12, 2018, in support of Cure 4 the Kids Foundation, Nevada’s only nonprofit outpatient treatment center for children affected by cancer and other life-threatening conditions. In its 9th spectacular year, more than 1,200 people attended Circus Couture in its new location at the Brooklyn Bowl on the Las Vegas Strip. This year, performances were not limited to one main stage and included numerous immersive experiences throughout the venue for attendees to enjoy. Due to overwhelming community support, and the support of sponsors and attendees, Circus Couture has raised $1.7 million dollars over the past nine years for childhood cancer causes. 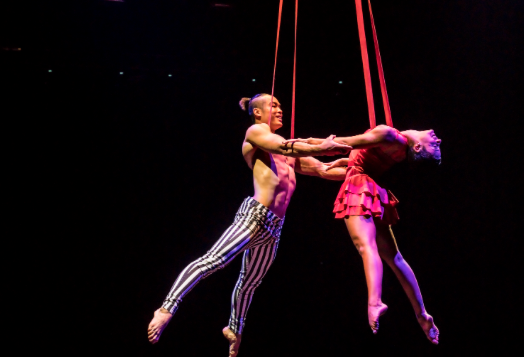 “Creating an immersive show, which most guests had never experienced, for a one-night event came with a lot hurdles to jump,” said Tyler McGee, Senior Artistic Director, Circus Couture. “But, witnessing our nearly 100 performers and countless volunteers come together and pour their hearts and talents into one cause and bringing this show to life was truly inspiring,” he said. Along with dramatic artistic performances and eye-catching fashion, the event included a live auction with many exciting experiences and artwork up for bid. The largest donation of the night came from Criss Angel of Criss Angel MINDFREAK® LIVE! Again this year, Angel stunned attendees with a $100,000 donation, purchasing all of the glass art pieces made by children at the Domsky Glass Studio. Angel says he will proudly display the artwork at the new Criss Angel Theater at Planet Hollywood. Circus Couture, which began in 2010, is a vibrant collection of performers, artists, fashion designers, makeup artists, models and technicians, who in their professional lives work in several of Las Vegas’ well-known production shows. In the months leading up to Circus Couture, this group of talented participants volunteer their time and talents for off-hours rehearsals, meetings, fittings, and collaborative sessions that make the one-night event an incredible success. Cure 4 the Kids Foundation is the only outpatient clinic in Nevada treating children diagnosed with cancer and other life-threatening diseases. No child is ever turned away from treatment for financial reasons, including those without medical insurance or who are unable to pay for treatment.